Pulpit erected 1906, St Andrew's Church, Westbury . Who was Nellie Payne? 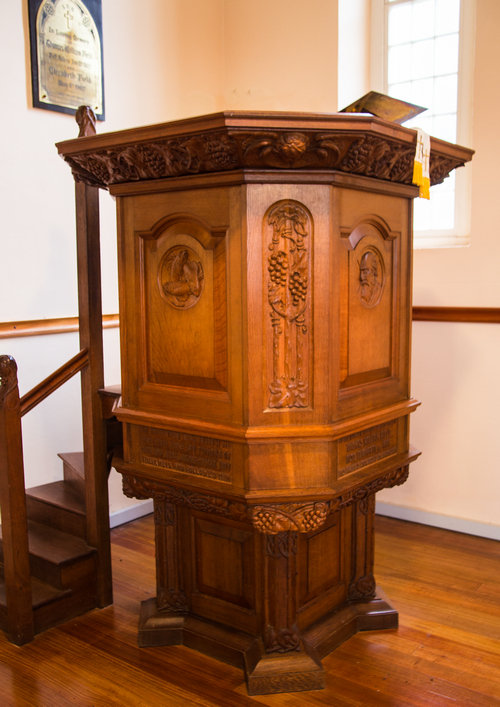 Extract re pulpit from “Ellen Nora Payne – Woodcarver of Tasmania” by Russell Atkinson. “It was at this time that her brothers and sisters in Tasmania wrote collectively proposing that they should set up some form of memorial to their parents, who were now dead. 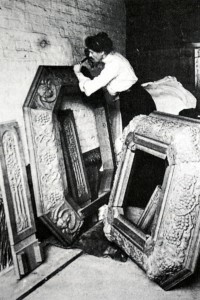 They suggested that sister Nellie, who had already achieved some repute as a carver in wood, should carve the memorial, and by general consent it was arranged that that memorial should be something that would adorn the family church of St. Andrew’s, Westbury. Finally, a pulpit, a much needed piece of furniture, was decided upon. 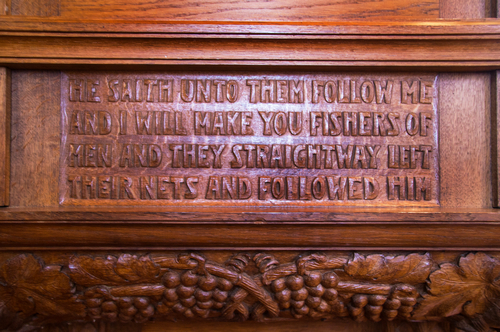 So there in the old coach-house, with panels of the best fumed oak, Mrs. Payne wrought upon the pulpit for many weeks, to a design that was appropriate and dignified, and which adequately reflected the sig­nificance of the occasion and the memorial itself. In St. Andrew’s this handsome pulpit stands today, a memorial to Thomas William Field, of Westfield, Westbury, and his wife Elizabeth. It was also a symbol of the Field family’s devotion to their church. Of it, Mrs. Payne said, ‘It was made of English oak, and I designed and carved it in England. It was put together by Moos Brothers, one of the best firms of cabinetmakers in London, and shipped out in parts and put together in Westbury by Mr. Hills, of Launceston. It was the Venerable Archdeacon Whitington, of Hobart, who, on the wintry evening of May 4th, 1905, dedicated the new pulpit, and there­upon preached the first sermon from it. The creator of it was still in England, but she received a full description of the ceremony and service in a letter written to her that night by the Rev. Dr. Basil Craig, the incumbent. ‘I appreciated all the trouble Dr. Craig had gone to in writing this for me,’ she wrote in her Short History of the church, ‘and Mrs. Charles Field also wrote me further details. She said it was a dreadful night – it rained unceasingly – but the church was well filled, considering the weather, and, although the service began at 7 and lasted till 9, it did not seem a minute too long. 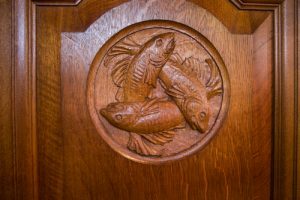 The Archdeacon gave a beautiful address, and they all liked the pulpit so much, and she never remembered seeing so many clergy in the old church before. 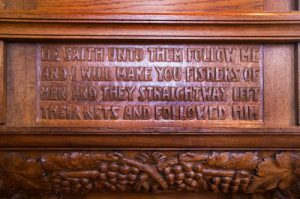 Another panel bears a carved invocation and memorial record, noting that the pulpit was presented to the church by members of the Field family in memory of their parents, Thomas and Elizabeth. 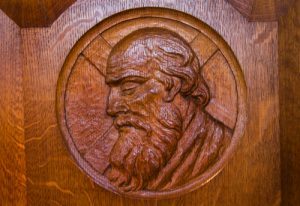 Shortly after it had been dedicated, the pulpit was occupied by His Lordship the Bishop of Tasmania (Bishop Mercer), who spoke ‘of those who had made the generous gift, and the object for which it was donated’.